When I first stepped off of the pulpit nearly six years ago, I felt that I no longer had daily access to the sacred. Instead of spending my time doing Holy Work in a synagogue and in the community, my hours were spent making certain that Ben’s needs were handled, taking care of our other two kids, cleaning toilets, marketing, and all of the myriad aspects of running a household. In other words, menial and/or difficult tasks that were devoid of meaning. But that is because I was limited by my understanding kodesh and chol as sacred and profane. Or special and ordinary. Instead, a radical shift was necessary. By applying Rosenzweig’s “not yet” approach, I began to view all activities as being either sacred or not-yet sacred. No matter the task, I started to seek out the holiness potential, allowing for every action to have a potential for sanctity and purpose. No one can say that the act of cleaning toilets is in-and-of-itself a sacred act. However, cleaning toilets is a reminder of the gift of indoor plumbing, not accessible to all humans. And potable water. And a roof over our heads. It is a reminder of the seemingly mundane bodily functions that take place behind the bathroom’s (sometimes) closed door. Suddenly, the physical drudgery is transformed into an opportunity to thank the Holy One. Which brings me to tea bags. Specifically, Yogi tea bags. Every Yogi tea bag has a snippet of wisdom attached to it. I don’t know where they find the aphorisms, but I love them. Even when a specific statement doesn’t resonate with me, I love the idea that something as simple as brewing a cup of tea has holiness potential. 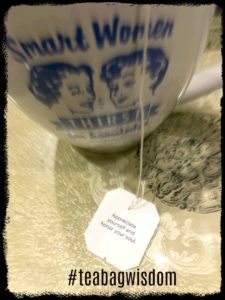 This post, then, is the beginning of a semi-regular series that I call #teabagwisdom. Because there is always a way to find meaning in the seemingly mundane. A long preamble — sorry, occupational hazard. The following pieces in this collection will focus solely on the piece of wisdom. Refracting daily activities through the Rosenzweig lens of “not-yet” has been one of the best ways to elevate my actions and my soul. Try it for a week. Regard every action, every event as either sacred or not-yet-sacred. Maybe jot down your reactions in a journal. Maybe reflect on your reactions as you prepare to sleep each evening. Did it make a difference after a day? A week? Leave me a quick note here in the comments. Let’s get this conversation started. “There is always a way to find meaning in the seemingly mundane.” Yes! Every aspect of the world has meaning because every aspect is in someway connected to other aspects of the world. There are connections to the past, to the present, and to the future. For example, regarding the past, I look at my body and recall my parents and other ancestors. Regarding the present, our first grandchild had his bris today and the ritual evoked tears of joy and appreciation. Regarding the future, I wondered how we could better help our children and our grandson. Additionally, given the sacredness of the bris and having followed national news I became angry that we are not doing more as individuals, as Jews, and as citizens of the U. S. to help perfect this very imperfect world. I have said “net yet” to myself many, many, many times over the last few years. Several of the “not yets” have now turned into things I’ve done or accomplished. I love this post so much! I have looked at the act of cleaning a toilet before with such discgust and then realized how thankful and amazed I am with the plumbing that we have (both internally and in the house). I try to be grateful and thankful everyday for the things I do have. Keyword is try, and I always appreciate reminders. I drink tea every morning and will now have to order some yogi tea :). I have been living my life this way for many years. For example, I don’t really enjoy housecleaning, but I remind myself that God created order out of chaos and expects us to take care of our little corner in the world – by keeping a clean and orderly home, we are doing that. My questions are – why does it take many people so long to live their lives this way? why do some people not live their lives this way? Living this way does make your life better and happier. Not yet is such a great concept. I loved this. Thanks for sharing, Rebecca! I like the preamble. I may even clean by bathroom because of it. No promises.